We offer a full range of chemicals including dries, solutions, solvents, acids, volumetric solutions, biochemicals, standards, high purity solvents & acids and speciality chemicals as well as kits for food and beverage analysis. The major brands we offer include: Fisher Chemicals, Acros Organics, Alfa Aesar, Ajax Finechem, Maybridge, Fisher BioReagents and LabServ Pronalys. Our range includes acids, bases, inorganic salts, solvents, Karl Fischer reagents, trace metal analysis and much more. From laboratory grade to trace metal grade, we provide you with high-quality products for accurate results no matter what your requirements. Bioreagents, antibiotics, stains, biochemicals, cytology reagents, buffers, organic and inorganic chemicals to suit your requirements in the academia and pharmaceutical setting. 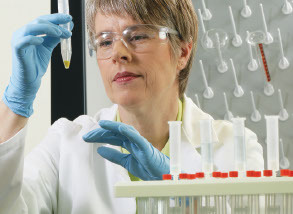 Our high-purity products are designed for a wide range of applications to suit your research needs. We offer a wide range of HPLC, Optima, LC/MS and UV Spectrophotometric grade solvents, standards, reagents and concentrates from Thermo Fisher Dionex, Fisher Chemical and Ajax, all carefully packed for thorough protection. Fine chemicals in pre-pack and semi-bulk quantities, offering more than 90,000 chemicals to research and industrial customers. Important in acid-base chemistry, Thermo Fisheru2019s offer buffers and volumetrics in a range of sizes and concentrations to meet your needs. We offer NIST certified, as well as ISO Guide 34 certified standard buffer solutions and concentrates, ready to use for pH measurement. For a complete range of stains and solvents for use in histology, microbiology, haematology, cytology and parasitology. High quality standards and certified reference materials to meet your requirements. Covering organic, inorganic, environmental, petrochemical, ICP and ICP-MS, pharmaceutical, speciation, food and beverage, pesticides and much more. A comprehensive range of non-bleeding Indicator Strips for pH and other rapid-analysis applications. Always ready to use, patented technology for optimal sample protection, brilliant colours for exact results.